With your Thermomix or Bimby, you can easily make your own Pita Bread Wraps at home and avoid all of the preservatives of shop bought wraps. This wrap recipe is sugar-free and dairy-free. In this order add salt, flour, yeast, olive oil and water to mixer bowl, mix for 10 sec/speed 4/MC on. Knead dough for 3 min/knead/MC on. Leave the dough rest in the mixer bowl for 15 min. Knead dough for 1 min/knead/MC on. Remove dough from mixer bowl to a glass bowl or silicone mat. Yes the dough is sticky, its meant to be! Flour considerably and roll out individual pita breads. Do them thinner than you think, as the yeast makes them rise on cooking. Cook on medium heat on a dry frying pan for 2-3 min each side or until slightly browned. Keep in a thermal server or wrap in a tea towel to keep warm. Yes this dough is sticky! Its meant to be! Use extra flour while rolling and this will perfect them. I have successfully used whole meal, atta and spelt flour for these wraps. They freeze and defrost very well. At step 1 mix on speed 6 for 10 seconds. At step 2 knead on speed ⅔ for 1 minute and then rest, 1 minute and then rest, then the final 1 minute knead. At step 4 knead on speed ⅔ for 1 minute. Anyone made these with gf flour? Do you need to alter the amount of flour or anything? There are a few posts in Skinnymixers about making these with Gluten Free flour. Some have had success and some haven’t. The key point is to add more flour if needed and adjust to get a good dough consistency. These wraps are amazing, even my extremely fussy husbands says we can’t go back to store bought wraps after having these, my kids love them too. Can you make these with almond or coconut flour? I could eat them on their own (ok I do all the time!). Definitely a top 5 Skinnymixers recipe for us! Wow, these are great! Rolled really thin and they were so easy to roll and fold…much easier than store bought!! So easy in the roti maker!! yep. I use it all the time. perfect. Delicious and sooo easy! I made these to accompany the lamb feta meatballs and tzatkiki from THMII. Yum!!!! The kids loved eating them plain too. Has anyone had success with halving the recipe? I tried to and the mixture turned out too runny. I did. But I used wholemeal flour so don’t know if that made the difference. Just wondering if these would work with a gluten free flour? This will definitely be my go to wrap recipe. They turned out absolutely perfectly. I left the dough in the bowl to prove with the addition of 4 cloves of confit garlic. Kneaded it another 1 minute as the recipe says and turned out onto the mat with lots of flour. I managed to get 14 out of my batch. Hate store bought ones. Every time I pick them up I read the back of the packet and then change my mind! Will be making these over and over. Thanks Nik. These are amazing, have tried several different recipes but these are the best I’ve found. Going to have to make up a few batches and freeze, the kids loved them so much they ate the leftovers plain. Perfect for so many uses. This is the first time I’ve made anything like this and I knew Skinnymixers wouldn’t steer me wrong!! They worked perfectly and were a hit with the family, not to mention easier than I expected. 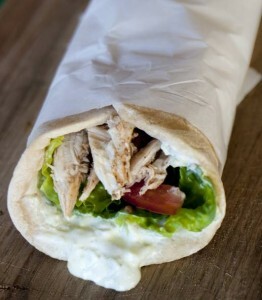 Great flavour wraps! Made with Greek lamb and salad. Definitely a wrap of many purposes! Has anyone managed to leave it any longer than 3 days? I don’t know why it seems like it’s just me but I had serious aggravation with these pita breads tonight. The dough was completely unmanageable and I wasn’t able to roll them out at all. What could I have done wrong? Yet another winner! Miss 7 helped me make these, so good. These were delicious and so easy – definitely another skinnymixers recipe on the regular list! Turned mine into pita chips and gained the praise and admiration of our friends when we took them around for nibbles. So easy, so yummy, and would be great when unexpected visitors turn up! Made these for first time tonight, think next time I will be better at shaping.. After frying them I sliced into small triangles & then cooked in the oven until crisp. They make great crackers for dips. OMG!!! These were amazing and so easy! My husband was very impressed as well, he couldn’t believe I made them from scratch! Love these! Make them all the time! These were Great. Thanks. Make sure you use lots of extra flour for rolling. Will make these regularly now! These wraps are so good! So much better than store bought. You can roll them without splitting and they are so soft and make great mini pizza bases with leftovers that are a bit stale. Can this recipe be doubled? Last time I made them for dinner my husband ate half of them at lunch time! What does MC mean in the recipe? Thanks. Ermagherd- why did I wait so long to make these? Very easy to make and toddler friendly too with the rolling out and sampling of the cooked product. I think you could get more than 12 out of the mix so will try that next time. Thanks again for an awesome recipe Nikalene. How long do they need to prove in thermomat after kneading and removing from bowl? I need to know too.. please. I didn’t proof at all in this step, started rolling and cooking straight away… Have made 2 batches so far and they are perfect! Hope this helps! Making these tonight to compliment the awesome skinnymixers Greek lamb slow cooked melt in ur mouth!! I’d like to know also…. I used the gluten free co plain baking flour mix (potato and rice no raising agent) as per the recipe. They worked but I was unable to get them as thin as desirable so they did rip if I wasn’t super careful and ended up a bit thin for easy rolling. We all loved them though. I used almost an extra 100g of flour to roll them and only managed 11 not 12. Hi 🙂 could I sub plain spelt flour for bakers flour? Anyone tried doing this? Thanks! WOW! Had these with the Mexican pulled pork last night – kids and hubby said BEST EVER! These are soooo yummy, made them yesterday and my sister said they were so good even my husband enjoyed. The best ever recipe, Thanks Nikalene. We only buy kebabs from one shop, it’s the best in Canberra. I think mine (yours!? Lol) are way better. I pretty much refuse to eat the shop ones now. The one in Yarralumla? Mmmmm!! These are super easy to make and the dough was sticky, but not impossible to roll out. Very yummy! We had them with the slow cooked mexican pulled pork and coleslaw. Delicious! Made these heaps of times. Delicious, easy and a hit with the family. Sooooo good. Easy enough and delish!! Made the full batch ate for 3 days (seriously fed my family for that long! 2 adults 1 child) . Day 1 as wraps day 2 dipped in curry and the 3rd day as a pizza base. Perfect for all applications!!!! My go to wrap recipe. Super tasty, won’t buy pre made ever again. Easy recipe to follow. We LOVE these with Butter Chicken…..can (and will) eat them together for days on end! Sticky dough but well worth it and as others have said a lot easier with oil on your hands and rolling pin. Will this work with gluten free flours? Any suggestions please would be great, thanks! I used the gluten free co plain baking flour mix (potato and rice no raising agent) as per the recipe. They worked but I was unable to get them as thin as desirable so they did rip if I wasn’t super careful and ended up a bit thick for easy rolling. We all loved them though. I used almost an extra 100g of flour to roll them and only managed 11 not 12. I’ve always been a bit intimidated by recipes using yeast but these pitas were so quick and easy and tasted fantastic. We used them to make souvlakis and will be making them again soon I’m sure. My absolute favorite pita wrap to make. Love these, make them for lunches regularly, best wraps ever! These pita bread wraps are amazing. They are fabulous as souvlaki wraps but we also love them with Mexican fillings or just to use as a dipping bread with dips, dukkah/oil, curries etc. My kids LOVE these . A real family favourite in our house. These look fab, what is the filling? 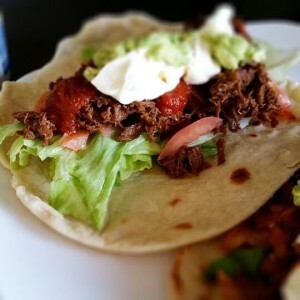 Newbie thermomix owner, so I am slightly overwhelmed – these wraps look truly delicious! Delicious! Ive made 2 batches today, we all love them!! These wraps are fantastic. They are a staple in our kitchen and they freeze really well. I love that i can make them whatever size suits me as my kids are younger and so i make slightly smaller wraps for them. How do you best freeze the wraps. I need to get them away before I keep eating them! Cant eat a curry without these!! Sticky but so worth it and makes a few meals worth for us! Delicious! Use oil on your hands and rolling pin to make it easier. Will be making again for sure! Love these! Easy and tasty.